Cody Roney, the incoming executive director for Lula Lake Land Trust, poses for a photo with Mike Pollock, the outgoing executive director for Lula Lake Land Trust, Friday, February 8, 2019 at Lula Lake in Lookout Mountain, Georgia. 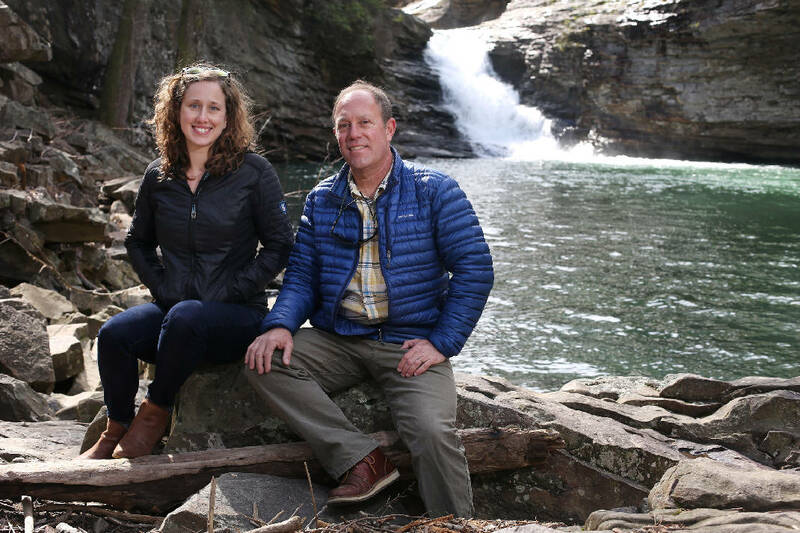 Lula Lake Land Trust has hired a new executive director from across town to lead the land conservancy, leaving an opening atop the Chattanooga-based Southeastern Climbers Coalition. Former SCC executive director Cody Roney began last Monday, replacing Mike Pollock. "We felt like the experience she had gained at the Southeastern Climbers Coalition had prepared her really well to assume the leadership of Lula Lake," Pollock said. SCC had two full-time employees, including Roney, and a network of volunteers. The new position gives her the chance to lead a bigger organization dedicated to land conservation, recreation and education. Pollock, 55, announced in September that he would be resigning. When hired in July 2015, he agreed to stay in the position for about three years. Now he plans to spend time traveling, finishing projects around his home and working on his hobbies, such as woodwork. He also plans to explore other ventures after the sabbatical. There will be a couple of weeks of overlap between the two as Roney settles into the new position. "I'm just excited to have a new generation in charge of Lula Lake," Pollock said about Roney, who is 33. "I think that's a necessary step and exciting for me to watch unfold, as we will over the next several years." Both SCC and Lula Lake are land conservation groups, with the climbers coalition focusing more on recreation and Lula Lake focusing more on conservation and education, Roney said. She is excited to explore the new role and help grow educational outreach at Lula Lake. Pollock will take over as the chairman of the Lula Lake board and work regularly with Roney on projects. They plan to talk weekly about the land trust. Roney is going to take time to meet with staff and the board and learn about the trust's history before looking toward the future of the organization and any changes she plans to implement, she said. The climbers coalition's other employee, Angie Langevin, who was previously the stewardship director, moves into the interim role of executive director. She hopes to get the full-time job, she said, but the coalition's board will conduct a search through the end of the month to give others the chance to apply. Roney will help lead the hiring process, just as Pollock did for his replacement. If Langevin is hired as the full-time director, the coalition will hire someone to fill her old position, she said. If that happens, they'll also take time to see if any changes should be made to the position, she said. In the meantime, Langevin will work on the company's database and try to streamline some of the work, moving everything to digital platforms where possible. "A lot of the boring stuff," she joked. The moves have been amicable for all sides, Pollock and Roney said. Pollock gets to take a break and do things he's wanted to for a long time, Roney gets to move to a larger organization in town and Langevin has a chance to fill the top job at SCC. "I don't think anyone has any curiosity about there being bad blood on any end of this, but there's not," Roney said. "I think we have a great relationship. I left SCC on great terms. Mike is leaving on great terms. It's a very positive, forward-moving, forward-thinking transition."